The computer will open Photoshop and start creating a painting. It will use an array of symbols, brushes, and shapes all, relating to the idea of vacation and its opposite–work. Once the painting has been completed, the software will upload it to the website awayonvacation.live and post it to the aritst’s Twitter and Facebook accounts. 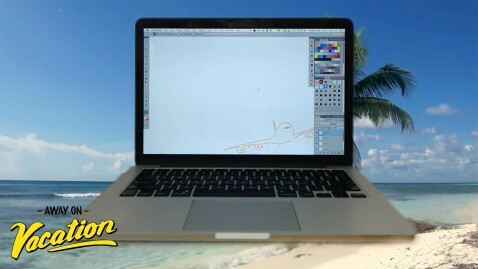 The Away on Vacation live-stream will continue around the clock for two weeks beginning on the 24th of May, and by the time it stops, it will have created approximately one painting an hour for an estimated total of 340 paintings. Away on Vacation will be offered for sale as an installation. In addition, according to the sales contract devised by Lund, the collector will also receive the right to have produced five paintings of his/her choice, one per year for five years. Interested parties are invited to contact Steve Turner, Los Angeles or the artist for more details. Jonas Lund (born 1984, Linköping, Sweden) creates paintings, sculpture, installations and new media works that incorporate data from his studies of art world trends and behavior. He earned an MA at Piet Zwart Institute, Rotterdam (2013) and a BFA at Gerrit Rietveld Academy, Amsterdam (2009). He had solo exhibitions at Showroom MAMA, Rotterdam (2013) and Steve Turner, Los Angeles (2014 & 2015). Lund’s work was included in group exhibitions at Eyebeam, New York; New Museum, New York; The Moving Museum, Istanbul; Van Abbemuseum, Eindhoven; De Hallen, Haarlem; and Whitechapel Gallery, London.